The DCS-2120 is D-Link’s first Internet Camera that supports 3G Mobile Video, enabling consumers a flexible way to monitor a home or office in real time anywhere within a phone’s 3G service area. The DCS-2120 offers both consumers and small businesses a flexible and convenient way to remotely monitor a home or office in real time from anywhere within a mobile phone’s 3G service area. When used in conjunction with the email alert system, mobile users can now view a camera feed without a notebook PC and wireless hotspot. This live video feed can then be accessed through 3G cellular networks by compatible cell phones*. In addition to cellular phone monitoring, the 3GPP/ISMA video format also enables streaming playback on a computer. The camera is also viewable from any Internet Streaming Media Alliance (ISMA) compatible device and offers support for RealPlayer® 10.5 and QuickTime® 6.5 viewing. The DCS-2120 supports resolutions up to 640x480 at up to 30fps using compression rates. 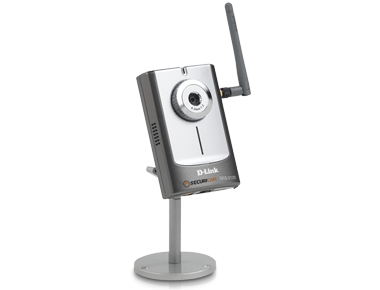 D-Link’s IP surveillance camera management software is included to enhance the functionality of the DCS-2120. Manage and monitor up to sixteen compatible cameras simultaneously with this program. You can also use IP surveillance to archive video straight to a hard drive or network-attached storage devices, playback video, and set up motion detection to trigger video/audio recording or send e-mail alerts. Alternatively, you can access and control the DCS-2120 via the web using Internet Explorer. As you watch remote video obtained by the DCS-2120, you can take snapshots directly from the web browser to a local hard drive, making it ideal for capturing any moment no matter where you are. The DCS-2120 features light sensitivity down to 0.5 lux and is capable of capturing video in rooms with minimal lighting. Low lux sensitivity ensures that the camera’s picture quality remains stellar even when lighting conditions change. This, coupled with the camera’s 4x digital zoom**, makes the DCS-2120 a potent surveillance solution. The DCS-2120 is a cost-effective and versatile security solution for your home or business. * 3G phone must be equipped with 3G video playback such as RealPlayer® or PacketVideo for Symbian or PocketPC. **** Latest software and documentation are available at http://support.dlink.com. Use of audio or video equipment for recording the image or voice of a person without their knowledge and consent is prohibited in certain states or jurisdictions. Nothing herein represents a warranty or representation that the D-Link product provided herein is suitable for the end-user’s intended use under the applicable laws of his or her state. D-Link disclaims any liability whatsoever for any end-user use of the D-Link product which fails to comply with applicable state, local or federal laws.